Using Lego bricks, students from Osaka University built a 1:560-scale model of the Nintoku-ryo burial mound. 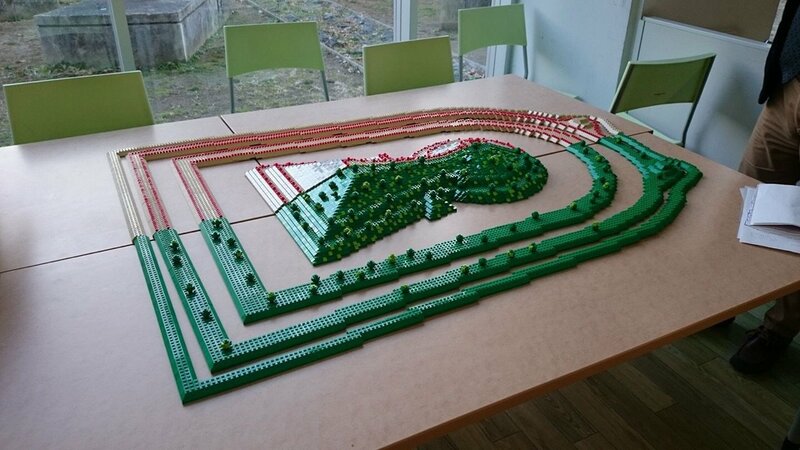 The Osaka University Lego Club members used 3-D computer graphics to faithfully reproduce the moat around, and the slopes of, the giant keyhole-shaped burial mound in Sakai, Osaka Prefecture.The project required 10,000 Lego bricks. It took them two weeks to work out the design by using modeling software that is distributed by the Lego Group. It took about a month to assemble and the project was completed in December. The cost of the bricks was 300,000 ¥ ($2,700). The resulting Lego burial mound is 150 cm (5 ft) long by 100 cm (3 ft) wide and 8 cm (4″) tall. White bricks were used for the left half of the model, where miniature “haniwa” clay figurines were placed, to show what the burial mound probably looked like after it had been built. The right half was modeled after the current, thickly wooded mound. The club members were such perfectionists they placed a stone coffin, swords and glassware in chambers within the square and circular parts of the mound. Frans Snik’s model of the VLT even includes the four lasers that are used to create artificial stars in the Earth’s atmosphere so that the adaptive optics system can remove the effects of atmospheric turbulence. The office of ESO’s Director General, Tim de Zeeuw, is already home to Frans Snik’s earlier model of the E-ELT. The first example of the new VLT model was presented to de Zeeuw to sit alongside its big brother. Frans Snik himself made the presentation via video link. Frans Snik’s model of the VLT is set against a background photograph from the actual telescope site in Chile’s Atacama Desert, with the Milky Way rising majestically into the sky above.